The DXO ONE workflow just got a little easier for Mac users. 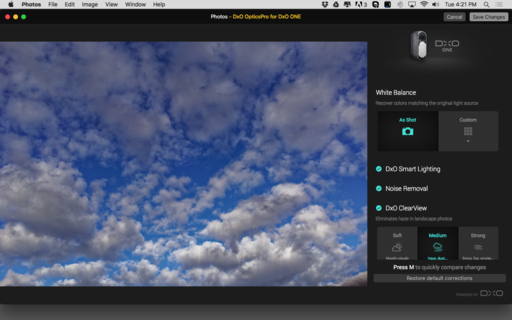 Now there's an Optics Pro editing extension just for the DxO ONE camera and Photos for OS X. And it works pretty well. Instead of having to use a completely separate app, previously DxO Connect, ONE shooters can now import their RAW/Jpeg pairs directly into Photos for OS X. Then, simply select the image for adjustment, go to Edit mode (make sure you're working on the RAW file), and choose DxO Optics Pro for the DxO ONE from the list of editing extensions. This gives you access to lens corrections, Smart Lighting, white balance, and DxO ClearView. There are presets within the adjustments to help you get the look you want. 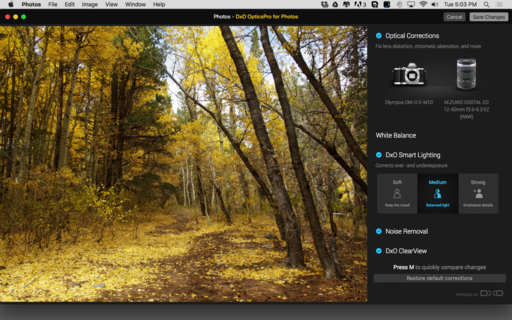 After doing so, click on Save Changes, and you're returned to the standard Photos for OS X editing environment. 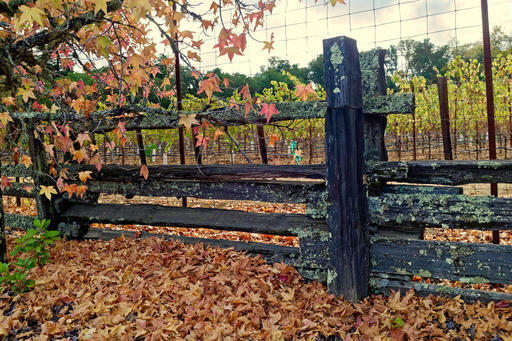 Here, you can continue to work on your picture if necessary using Photos' standard toolset. The adjustments are quite powerful. Compare the top image, processed with the Optics Pro editing extension, with the middle photo that's straight out of the camera. Both Smart Lighting and ClearView can add a lot of pop to a picture. The editing extension is free, but of course you have to have a DxO ONE camera to use it. If you don't have the ONE, there's also DxO Optics Pro for Photos that uses modules for many of the common camera/lens combinations. 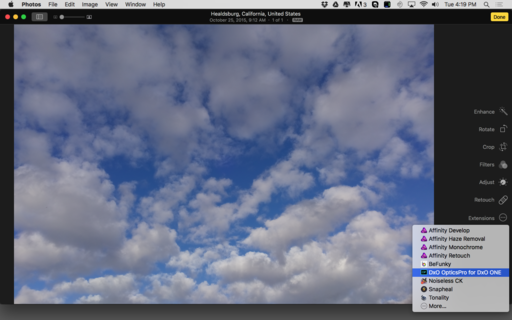 DxO Optics Pro for Photos is currently on sale for $9.99 in the Mac App Store. You'll need Mac OS X El Capitan and a 64-bit processor to run either app. To learn all the ins and outs of the latest version of Photos, take a look at Photos for OS X Essential Training on lynda.com. And don't forget about the Photos for OS X Special Feature Section on The Digital Story. It's a roundup of tutorials, videos, and articles focused on helping you master Apple's latest photo management software. You can also find it under Photography in the top nav bar. Here's an image captured with the DxO ONE camera and processed with the Optics Pro editing extension in Photos for OS X.